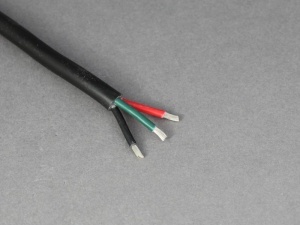 Multi-core, 2.5mm2 cable consisting of 3 cores of tinned, thin wall cable with a PVC sheath. The tin coating on the copper conductors makes them resistant to corrosion so this is particularly suited for low voltage applications in marine and other harsh environments. I telephoned for advice and two wires which I got from a very friendly and informed person who delivered via post the said wires promptly and correctly. Its now up to me use them correctly. I'll be back if and when I need some more 12 volt gear and I would highly recommend 12 volt planet.